Morwood was a champion schoolboy footballer in South’s zone with local club Noble Park. He was given his chance by coach Ian Stewart, but was relegated to the background under Des Tuddenham. When Stewart returned Morwood prospered and a few years later when he was reluctant to move to Sydney, he was approached by Stewart, then General Manager at St Kilda, to join the Saints. In a bitter clearance dispute the Swans refused to clear Morwood and Silvio Foschini. Foschini’s case went all the way in court and he lined up for St Kilda the following day. The VFL was stunned when Morwood played without a clearance and it led to a rewrite of the rules. He gave St Kilda good service, winning the best and fairest in 1985, then surprisingly returned to the Swans. When the club was hit by financial problems he was dumped from the list. 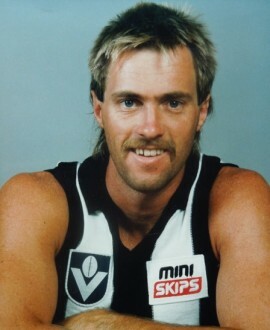 He was talked into playing for Collingwood in 1987, but the business pressures of running a hotel forced him into retirement after just one season. He said in later years that he had some regrets over breaking the clearance rules, but believed that it had helped get a better deal for all players.